Macy’s.com was looking for a way to develop new digital innovations faster than their current model, so they started a lean development initiative. GroupGifting was one of the projects they decided to explore, and the first lean dev team I was placed on. The MVP was developed two weeks before kickoff working as a pair with a UXA and a PDM. It was from that point parsed down to fit within technical restraints. Aimed at Macy's customers (women in their 30-50's) and more specifically our Registry Users. User research indicated users would often purchase smaller items in their registry and then return to them to buy big ticket items they felt were too expensive and felt guilty asking for. 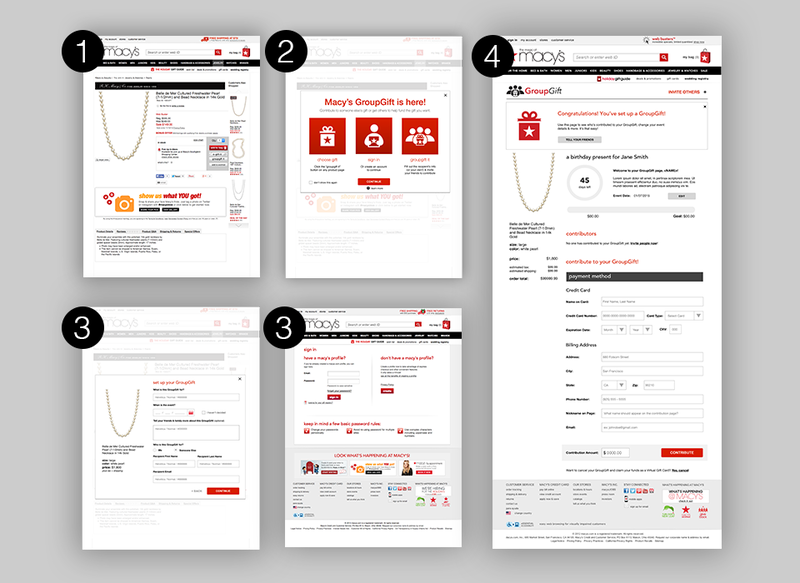 If we deliver macys.com customers GroupGifting then items that aren’t normally gift-able (big ticket items) would be easily gifted and result in an increase of sales in these items and reduced returns. (commonly practiced behavior in registry according to user research). Quick analysis of similar/adjacent products out there. One thing to note is the products that had the most impact were the ones that included some sort of story telling which we wanted to add into our product. Allow user to create a groupgift for either themselves, or someone else (initiator). Allow user (contributor) to contribute to existing group gift. Allow recipient to redeem a groupgift, either as the item gifted or as a egiftcard to buy the thing they actually want. Group gifting contributor flow (minus non site interactions, email confirmation, etc). Created after there was not enough support to create a working product in 2 weeks, this solution was created to capture customer feedback and see if there was signal to continue building. If we create group gifting and allow the gift giver to break up payments over time for items we alleviate the guilt associated with requesting big items. If we allow group gifting for any event or occasion, it will make it easier for customers to use Macy’s repeatedly for life events resulting in repeat visits, increased sales, and brand loyalty over time. If we allow 3rd Party organizers to manage group gifting for friends and family, it will give customers more reason to use Macys as an event planning destination and will result in more community engagement and participation in gift giving. If we create group gifting we can allow customers to request funding for entire sets of items/eliminate receipt of incomplete sets therefore lessens returns. If we enable notifications to group gift participants, it will provide funding status updates and progress towards fulfillment that will result in repeat visits, higher likelihood of funding, and gift giving recognition. 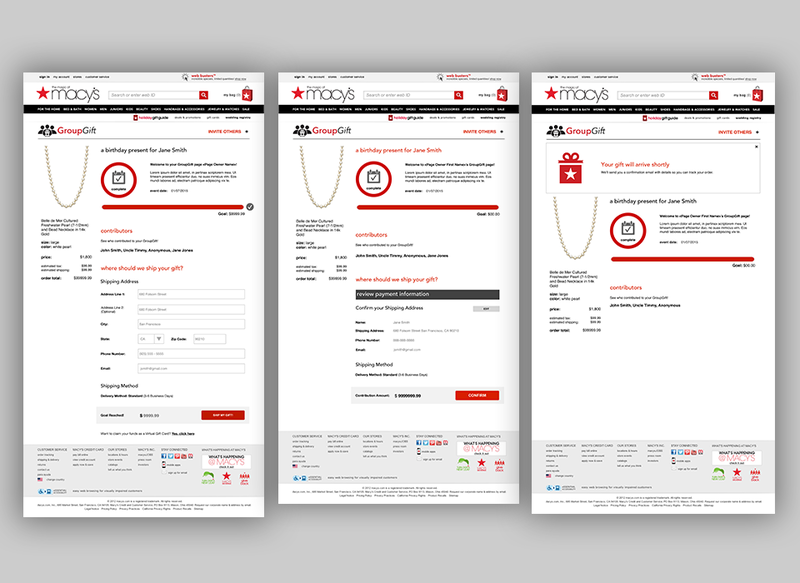 If we optimize a frictionless checkout when contributing to group gift items, it will allow for quicker checkout, rather than going through the multi-step macys.com checkout process and it will result in less form fields to fill out, allowing for quicker donation fulfillment and higher conversion rates. If we allow group gift recipients to top off the remaining balance on a group gift, it will increase the likelihood of a gift being fully funded and increase shopping cart conversion/higher margins through incremental sales. If we enable telling a story behind the group gift and it will give friends more reason to participate in the group gift fund resulting in higher participation in group gifting. If we offer recipients the ability to thank gift givers from group gifting, it will make it easier for them to track who has been thanked, and will also result in gift givers feeling recognized and bring suprise and delight to customer.